The Kosi River in Bihar, one of India’s poorest and most populous states, jumped its banks on 25th July,2007 after a dam burst in bordering Nepal, causing the worst floods in the area in 50 years. Almost 13 million Indians were affected by it. There was a lot of furore about Bihar Chief Minister Mr. Nitish Kumar’s visit to Mauritius the next day when his own state was reeling from this devastation. The political tussles have become a sort of rituals. 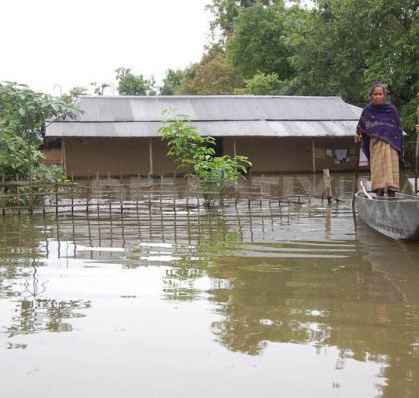 And the flood victims are forgotten as soon as the flood recedes. During the event of political game, innocent people are left uncared for. This incident had ignited the flame in me to write for the flood victims and their blending of emotions. Mere sharing of essential commodities is not enough. We need to stand by them and help them in rejuvenation and gaining confidence to lead a better life ahead. As the sun shone quite bright. Of having a day such a wonderful one and fantastic. Of living happily ever after. But death is always hovering in the mind. No house to remain and no hope of dear ones to regain. And seems to follow you always behind? Seeing the conditions which can’t be repaired. To show a miracle and add shine. Even at the cost of losing his pulse. Is a scene often seen when hunger reigns on top of the throne. Hunger, pain, epidemic and thunder. Even without glancing sometimes at others’ need. One should donate whole-heartedly if that is the case. Have you thought who is faulty for this? But he knows not wealth is where public health is.